Indie Retro News: Oubliette - A new Amiga top down dungeon crawler with a famous sprite! Oubliette - A new Amiga top down dungeon crawler with a famous sprite! Just as I was about to sit down and watch a damn fine movie, along comes another Amiga game that I just had to mention! This is ' Oubliette ' by James Wilkinson; a brand new Amiga game that has been in development for the last few weeks and has only since been uploaded to Aminet. 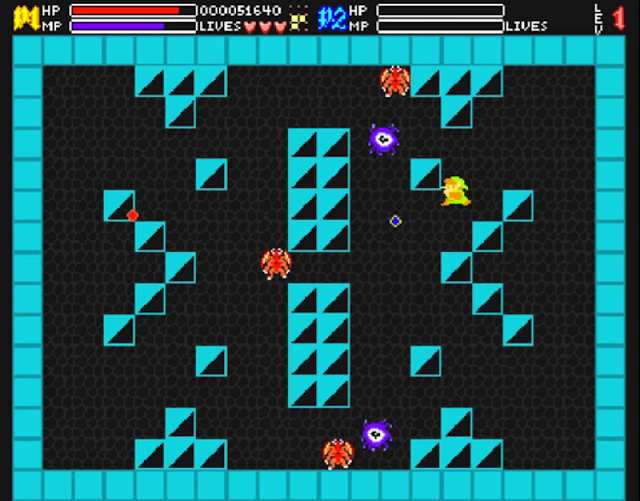 According to the developer this game is an 8-bit randomised dungeon crawler with lots of sword slashing, fireballs and dragons, but more especially the main character is straight out of Zelda as Link! This rather fun little game was developed with AMOS Pro, Deluxe Paint, Pro Tracker and music addition by TobbX, with additional graphics by cesarloose. You will also need at least a 68040 with extra memory. So those of you with stock A500's and A1200 may likely have a problem running it smoothly, if at all.